The Cabinet of Ministers at a meeting on April 20 appointed former head of Polish railway company PKP Cargo Wojciech Balczun head of PJSC Ukrzaliznytsia. "I want to build a team that will work towards changes. First of all, it should consist of Ukrzaliznytsia workers because they possess the greatest amount of knowledge. Due to my experience of restructuring of PKP Cargo, the company staff became the key to successful restructuring. They know weaknesses and what should be done to change this. It is necessary only to push them to do this," the new head of Ukrzaliznytsia said. 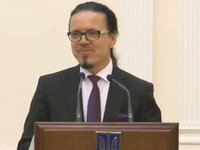 Balczun said he intends to organize Polish-Ukrainian communications between the employees of Ukrzaliznytsia.